Political tectonic plates are shifting in France. Marine Le Pen’s National Front won more votes than mainstream rivals in the first round of regional elections at the weekend. Whatever happens in the second round, the biggest casualty of her success could be the ruling Socialists’ economic reform plans. The far-right party had its best ever showing, securing nearly 30 percent of votes overall and coming top in six out of 13 regions. The conservative Les Republicains and their allies were second while the Socialists and other left-leaning parties trailed in third. A bounce in President Francois Hollande’s personal ratings after the Nov. 13 Paris attacks failed to translate into votes. Those attacks focused the national debate on issues dear to the National Front’s heart. Concern about security is rife and there is much soul-searching about cultural integration in a country that prides itself on being a secular republic. But Le Pen’s anti-immigration stance is not the only part of her manifesto which resonates with voters. Her staunchly protectionist agenda advocates “economic patriotism” as well as measures to prevent offshoring of jobs and what she terms unfair competition from countries with very low labour costs. Le Pen is channeling voters’ worries about high unemployment, job insecurity, and proposed budget cuts. The head of the French employers’ group, Medef, warned before the regional elections that her proposals were the exact opposite of what the country needed. But there are also 666,600 more people out of work now than when Hollande took office and the national unemployment rate, of 10.8 percent, is higher than in the euro zone. This may explain why a majority of voters tell pollsters they are favourably disposed to the idea of economic reforms while also voting for a party whose economic manifesto promises to undo change. The French government’s deficit-reduction promises have already fallen by the wayside as Hollande has said national security trumps EU budget rules. Its reforms now risk falling victim to voters’ economic insecurity. 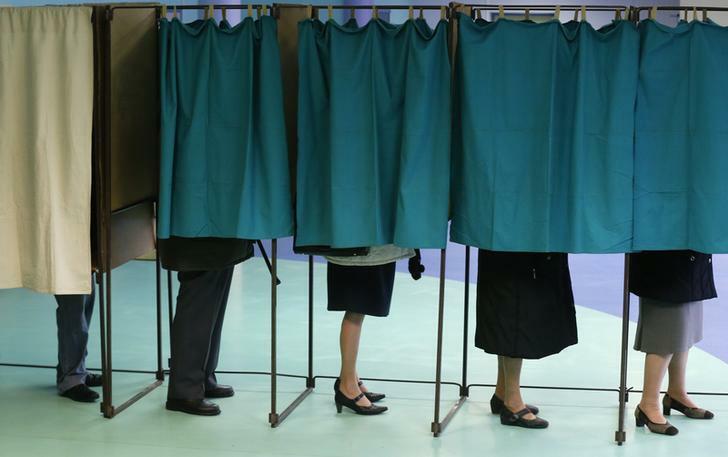 People stand behind a curtain in a polling booth during the first round of the regional elections in Henin-Beaumont, France, December 6, 2015. France’s far-right National Front won nearly 30 percent of the vote in the first round of regional elections. This was the highest score ever for the anti-Europe, anti-immigration party, which came first in six regions out of 13. Run-off elections will be held on Dec. 13.